"I don't want anyone trying to feed that girl... the law of the case is that she is going to die"
condition and the battle that is being waged in the courts on her behalf. We will present the documentation that exposes the lies. Terri's fight is one that should cause all Americans to take interest. It is indicative of a society which has ceased to embrace it's most precious attribute -- the ability to love all human life, regardless of handicap. Further, Terri's case has other ominous overtones, as it reflects upon a trend in American governments to shift more power away from the legislative branches to the courts. Are we headed for a one-branch system of government? "For I was hungry, and you gave me meat. my brethren, ye have done it unto me." 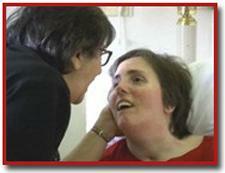 Terri Schiavo, in a recent news media report. Do these pictures portray someone who is in a coma? Does she appear to you to be in a vegitative state? Have you ever seen anyone in a coma sit up and smile? or cognitive behavior of any kind. or responding to external stimuli and internal needs. URGENT! See "Latest News and Information" below for recent developments. Then don't miss the important evidence of collusion, etc., under the heading of "Other Relevant Documentation". Several MUST READ items that begin to form the real picture of this case. At age 26, Terri Schindler-Schiavo, suffered brain damage from what appears to be a violent beating and possible strangulation by her husband. Now she has been sentenced to death. A list of relevant milestones in the case. If you've heard all the myths, and don't have all the FACTS surrounding the circumstances that have brought Terri Schiavo to the edge of death, read this. Every precious moment counts for Terri NOW. Complete report of Dr. William Hammesfahr, Nobel Prize Nominee for his success in reversing affects of stroke, etc. who examined Terri in 2002 - after 13 years of neglect ordered by husband Michael Schiavo. "She can communicate. . . The patient can clearly swallow, and is able to swallow approximately 2 liters of water per day (the daily amount of saliva generated). Water is one of the most difficult things for people to swallow. It is unlikely that she currently needs the feeding tube." Dr. Hammesfahr is a world renowned neurologist. He's offered to treat Terri for free. Says she "does feel pain, can swallow, probably doesn't need a feeding tube". There's more - lots more! Doctor for state's adult protective services finds Schiavo has been wrongly diagnosed. This scan, taken 53 weeks after Terri's collapse revealed that Terri had fractured ribs, damage to her pelvic area, LI vertebrae, spine, both knees, both ankles, a broken femur and a broken back. One doctor commented that "somebody really worked her over." Affidavits of three former nurses / caretakers of Terri Schiavo, relating their horror at the abuse and lack of rehabilitation and treatment regarding Terri's care. According to the Amicus curiae Memorandum Gov. Jeb Bush filed on Terri's behalf, he KNOWS Terri is being murdered, he KNOWS Judge Greer broke the law by his order to forbid oral feeding, and Jeb Bush KNOWS that he has the AUTHORITY and DUTY to step forth NOW! Governor has 'supremed executive power'. Q: "Do you not think he has done enough?" KEYES: "Of course not. He hasn't done ANYTHING! She's being starved to death!" "We're missing the most important point here. Removing the feeding tube is one thing, however, Judge Greer also ORDERED that no oral sustenance could be given Terri. Jeb Bush's amicus brief defined that act as the "deliberate killing" of a human being. That's murder! The law was broken from the bench." "What is intentionally NOT mentioned in the brief is that Judge Greer handed down two separate orders: 1) That Michael Schiavo could have Terri's feeding tube removed, and 2)That Schiavo could forbid giving Terri food by mouth. That can NOT be construed as "prolonging life by artificial means", not by any stretch of anyone's imagination, unless that individual is mentally warped. It is, in fact, murder by order of the court. The ACLU's argument is moot!" Brief eulogy by Darren Weeks. After "look-good" legislation passed by U.S. Congress, Schindler's lawyer petitioned a Federal Judge to re-insert Terri's feeding tube until a full hearing could take place. No way, Jose'! They want Terri DEAD. Period! The CNN D.C. reporter, Joe Johns, was saying that the Congress had to go to the hospice where Terri is, because "that's where all the machines are", insinuating that she's being kept alive by a bunch of machines..."
AP News: "Earlier Friday, a House committee was issuing congressional subpoenas to stop doctors from disconnecting the tube." Accusations exist that the Hospice is trying to limit where and how people protest. Nurse Cheryl Ford explains Terri's "exit protocol" as outlined by the killers at the Hospice. Why will they give pain killers if dehydration/starvation is painless? Very painful to read this; people must KNOW. An e-mail you can send to the Florida Nurses Association - PLEASE! The murder order does not call for the removal of the feeding tube.The murder order states that Michael Schiavo “shall cause the removal of nutrition and hydration from the ward. . .” This is far worse than just the removal of her feeding tube. It is a slow, agonizing, torturous death by dehydration. Black-robed Judge Greer is ignoring it. Impeach him! This could be good news for Terri. However, it is imperative that we be careful not to go to sleep on this issue. The real battle awaits the U.S. Supreme Court. The American people are being conditioned that the high court has the final say, regarding what is lawful. In actuality, it is only one branch of government. Editorial on Terri Schiavo. Read this! "I believe in the vows I took with my wife, through sickness, in health, for richer or poor. I married my wife because I love her and I want to spend the rest of my life with her. I'm going to do that." "So when you made the decision not to treat Terri's bladder infection you, in effect, were making a decision to allow her to pass on?" Schiavo "I was making a decision on what Terri would want." Where is Terri's Rehabilitation Money? Regarding Terri’s care, according to Cindy Shook, Michael Schiavo said, "My God I was only 25 years old. How the hell should I know? We were young. We never spoke of this." All of Terri's medical care has been influenced by a past chairman of the Hospice's Board of Directors - George J. Felos, attorney for Michael Schaivo, and a self-described "right to die" advocate. Rice's hire of Schiavo came at the same time guardianship issues were proceeding in the courtroom of his (Rice's) long-time friend, Judge George W. Greer where Schiavo was seeking to end the life of his wife by court order of Greer. And after Rice had repeatedly refused to investigate allegations of abuse against Schiavo. The Empire Journal has learned. . . that two FDLE agents have agreed, if served with subpoenas ordering them to give information known to them regarding alleged corruption and collusion in the Terri Schiavo case they'll tell a court about the order stifling their investigation and the alleged involvement of obstruction of justice by Bernie McCabe, state attorney for Pinellas and Pasco County. Transcript, March 18, 2005: "And I've also said that in court. We don't know what Terri wanted but this is what we want." She was advised not to go home that night but to spend the night with a girlfriend. But she went home. Hours later Michael Schiavo called Bob Schindler saying Terri was on the floor hurt. He did not call 911 first. Did Terri Receive Head Injury AFTER Hospitalization? Empire Journal reported CT Scan normal (no head injury) 2-27-90, two days after admission to hospital. Next CT Scan in March showed head injury. Terri is "biologically tenacious" so she had to be killed! Terri Schiavo is NOT a Cause, She's a Person! Jackie Rhodes, who worked and socialized with Terri, says Schiavo would frequently call his wife at work and leave her in tears. She says she and Terri had each discussed divorcing their husbands and moving in together. "Statutes were enacted in the 70s and 80s authorizing living wills. They were the first of a three part strategy to the ultimate goal of legalized euthanasia." Using a Tragedy to Push a "Mercy Killing"
This article is NOT 'more of the same'. WORTH YOUR READ! A good overview and behind-the-scenes peek at the greed, corruption, lies, collusion with public officials, and criminal acts by the end-of-life Hospices and in particular the company — and its employees — that owns the Hospice where Terri has been near death many times. Greer is "passing the test" with flying colors because he is permitting Michael Schiavo to abuse, exploit and neglect his disabled wife in defiance of the Florida statutes. And the Clearwater Bar Association cheers. Read the clear and easy-to-understand Florida Statutes that pertain to Terri and others in her predicament. Jeb Bush does NOT need further authority to rescue Terri! Michael Schiavo: "Um, I think I took her engagement ring and her...what do they call it...diamond wedding band and made a ring for myself." This piece is being posted for your further investigation. Is there something to this? Is Marjory Schiavo an alias? or Is it purely coincidental? "...transfer water from ME directly into Terri..."
The DCF has the authority to take Terri into protective custody under the law. Here is the law, and the phone numbers that you can call, urging them to do so. Phone and fax numbers, postal and e-mail addresses for you to contact. If you were in Terri's position, wouldn't you want someone to be a voice for you?